What if you could meet a beautiful, young woman who would inspire you to strive for your life’s greatest potential? You can. 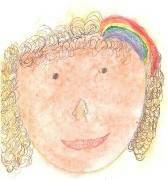 Eve (Evita) shares updates of her extraordinary life journey on A Rainbow in My Head’s home page. You will see creative coping mechanisms for dealing with life threatening illness, chronic illness and disabilities. She also sells some of the artwork that you see on her art page. Eve’s stories are a new feature at her blog.